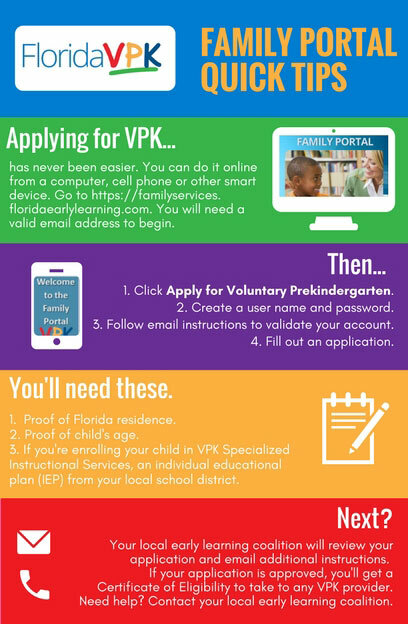 Applying for a VPK Scholarship is EASY! Please visit our office. Staff will be available to guide you through the application process. VPK is a FREE program aimed at giving your four year old the tools necessary to enter kindergarten eager and ready to learn. Parents may apply through the Family Portal to obtain a certificate online at familyservices.floridaearlylearning.com. To Re-Enroll, parents must apply through the Family Portal. On this page you will find information on how to sign your child up for VPK. If you need further assistance or have any questions, please call 407-960-2460. Parents may obtain a certificate online at familyservices.floridaearlylearning.com. Families who do not have access to a computer or a scanner may walk-in to use equipment in the ELC of Seminole’s self serve computer lab Monday – Thursday 7:30 a.m. – 5:30 p.m. VPK registration may be completed on a mobile device if the required documents are photographed using a PDF scanning application (e.g. Android’s Handy Scanner, Window’s Scan2pdf, Apple’s Genius Scan). Parents with a child who has attended no more than 70 percent of the VPK program may choose to transfer/reenroll their child with a new VPK provider if the reason for the transfer/reenrollment meets one of the approved circumstances (e.g., change of residence). If the child changes VPK providers more than once, the parent has to provide specific documentation to support the reason for the change. To do this, the parent or guardian must complete the VPK Reenrollment Application and bring it to the Coalition for review. Providers include a mix of private child care centers, family child care homes, faith-based centers and public schools. Each provider determines the days and times they will offer VPK services in order to meet the overall requirements. What should I look for in a VPK Provider? The Coalition offers a Choosing Quality Child Care check list to assist you in choosing the right program for your child. It’s OK to Play in VPK! 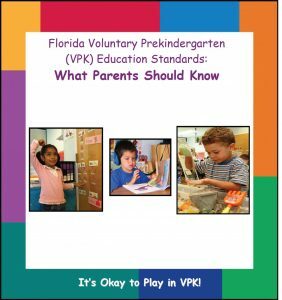 The parent handbook, “It’s OK to Play in VPK!” describes the characteristics of developmentally appropriate learning environments. It identifies how the VPK Education Standards can be used to help children of all different backgrounds, abilities, temperaments, and interests to learn and develop.